It has hiked the surcharge by 3% on earnings above Rs 1 crore, levied a pollution cess on petrol, diesel cars and SUVs, among others. It has hiked the surcharge by 3% on earnings above Rs 1 crore, levied a pollution cess on petrol, diesel cars and Sports Utility Vehicles (SUVs) and has offered a one-time compliance window for domestic black money holders slapping a tax and penalty of 45%. Presenting his third Budget, Finance Minister Arun Jaitley has also proposed a ‘Krishi Kalyan’ cess of 0.5% on all taxable services to improve agriculture and reduction of duties on project imports for the cold room for cold chain, refrigerated containers and a number of other items. Cigarette and tobacco products will become costlier with the hike in excise duty by 10 to 15%. While the revenue loss on direct taxes will be Rs 1,060 crore, Jaitley’s indirect tax proposal will mobilise an additional Rs 20,670 crore. The net revenue gain will be Rs 19,610 crore. Finance Minister Arun Jaitley will present the Budget for 2016-17 on February 29. The salaried class has a lot of expectations from the Budget. Increase in the personal income tax exemption limit and a higher deduction limit on home loan interest are among the common ones, say analysts. “Considering the increase in cost of living, the current basic exemption limit of 2.5 lakh should be raised to Rs. 3 lakh. Also going forward increase in basic exemption limit could be linked to the rate of inflation and be raised every year automatically,” says Neha Malhotra, executive director of taxation at Nangia & Co, a tax advisory firm. The salaried class also wants the deduction limit under Section 80C to be raised further, say experts. “The Section 80C limit of Rs. 1.5 lakh hasn’t been revised since FY 2014-15. It may see an increase this year. Possibly, the government may look at adding some saving products and increasing the limit to Rs. 2 lakh,” says Preeti Khurana, chief editor of Cleartax.in. Currently, Section 80C is too cluttered, say experts, with a large number of instruments qualifying for deduction under the section. Employee Provident Fund, which is a mandatory contribution for a salaried person, is also eligible for deduction under the section, consuming a major portion of the Rs. 1.5 lakh limit. Therefore, people especially in the higher income group are unable to claim deductions for other 80C-linked investments. “80C deduction should be linked to the income level – higher income taxpayers should be given higher limit for deduction i.e. 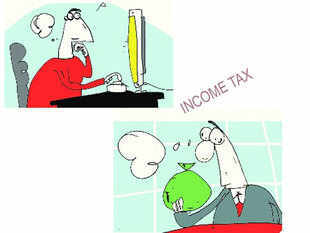 a slab for tax deductions based on the income” adds Neha Malhotra of Nangia & Co. Experts also feel that the infrastructure bonds should be reintroduced, both to provide an extra deduction to the salaried class and help the government raise funds for infrastructure projects. “To encourage savings for infrastructure development, the infrastructure bonds may be reintroduced with a sub-limit ofRs. 25,000,” says Anil Rego, CEO and founder of Right Horizons. Also, given the high property prices, the deduction for the home loan interest part under Section 24B part should be raised further, experts say. “The current limit of Rs. 2 lakh is low considering the costs involved in cities like Mumbai, where the houses are priced at a crore and above,” says Ms Malhotra of Nangia & Co. The huge delays by the builders in giving possession are adding to the cost of buying a property further. Therefore, experts believe that the government should relax the rules related to home loan interest exemption. As per the current income-tax rule under Section 24B, the buyer can claim the deduction on the entire interest paid during the construction period in five equal installments only after the completion of the construction of the property. It further says that if the construction of the property is not complete within three years, the borrower can claim only claim Rs. 30,000 per year of the pre-construction interest. The government should relax the norms, say experts. Also, there are certain sections whose deduction limits have not been revised for a long time and are far below the actual cost that people incur. These needs to be increased, believes experts. “Medical allowance of Rs. 15,000 per annum, education allowance of Rs. 100 per month per child and hostel allowance of Rs. 300 per month per child are too low considering the actual costs involved and have not been revised for a very long time, ” says Ms Malhotra. The Finance Minister has increased the surcharge on income above Rs 1 crore, from 12% to 15%. This means that the super-rich would pay approximately 1% more income tax as their effective tax rate increases from 34.6% to 35.6%. This will result in an additional cash outflow of approximately Rs 1 lakh per annum(see box). FM has also proposed to impose a Krishi Kalyan Cess at 0.5% that will be levied on all taxable services. Meaning, the effective service tax has now gone up from 14.5% to 15%. A small relief of Rs 3,000 has been given to small taxpayers. The tax rebate of Rs 2,000 has been increased to Rs 5,000 per annum. “Around 2 crore taxpayers in India report annual taxable income of up to Rs. 5 lakh, who will benefit from the scheme,” said Finance Minister Arun Jaitley in his budget speech. This rebate will be extended under Section 87A. Also, self-employed individuals who do not receive HRA benefits and do not own a house can now claim a deduction of up to Rs 60,000 under section 80GG for rental payment. Currently, this deduction is restricted to Rs. 2,000 per month. FM has proposed that this be increased to Rs. 5,000 per month. Effect of the increase in surcharge on various categories with income of Rs 1 crore. Government on Monday came out with one time four-month compliance window for domestic black money holders to come clean by paying tax and penalty of 45% per cent. Unveiling the Budget for 2016-17, Jaitley said those declaring their assets will get immunity from prosecution. “There will be no scrutiny or inquiry regarding tax in these declaration under Income Tax Act or Wealth Tax act and declarations will have immunity from prosecution. Immunity from Beneami transaction has been proposed subject to certain conditions,” he said. The government plans to open the compliance window under the Income Tax Disclosure Scheme from June 1 to September 30 2016 with option to pay amount due within 2 months of declaration. In the last Budget, the government had come out with similar compliance window for people holding undisclosed assets abroad. He, however said that tax evasion will be “countered strongly”. Capability of the tax department to detect tax evasion has improved because of enhanced access to information and availability of technology, the minister said. Jaitley further said the surcharge levied on undisclosed income called ‘Krishi Kalyan Surcharge’ will be used for agriculture and rural economy. “We plan to open window under the income tax disclosure scheme from June 1 to September 30, 2016, with option to pay amount due within two months of declaration. “Our government is fully committed to removing black money from economy… We would like to focus all our resources to bringing back black money to the books,” Jaitley said. India’s mutual fund industry is expecting an increase of Rs. 50,000 in basic income tax exemption limit to Rs.3 lakh in the budget to be presented on Monday. If done so, this can leave an additional liquidity of Rs. 50,000 crore in the hands of taxpayers, a part of which can go into investments. The mutual funds industry also wants that money coming under capital gains be invested in infrastructure mutual fund products. Mr Naqvi also said that government must allow money coming under capital gains to be invested in the infrastructure funds of the fund houses. “Moreover, the amount will be deployed by the MF industry for infrastructure projects which will further help nation-building,” he added. 1) Income of up to Rs. 2.5 lakh is fully exempt from tax in case of an individual of less than 60 years of age. 2) For taxable income between Rs. 2.5 lakh and up to Rs. 5 lakh, income tax is applicable at the rate of 10 per cent. 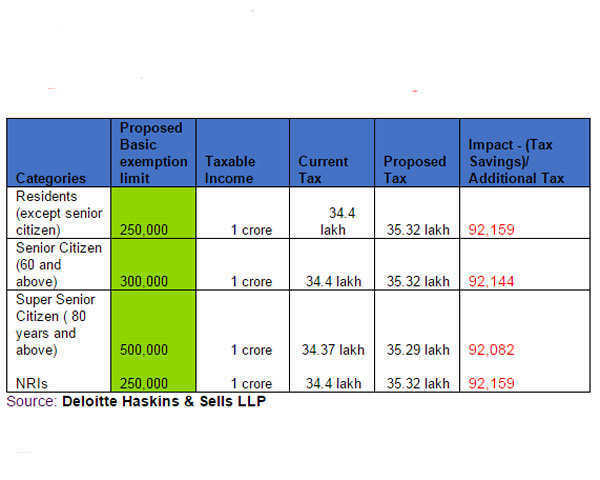 3) If taxable income is above Rs. 5 lakh but less than Rs. 10 lakh, income tax is 20 per cent. 4) Income above Rs. 10 lakh is taxed at the rate of 30 per cent. 5) Super-rich individuals with an annual taxable income of over Rs. 1 crore will have to pay surcharge of 12 per cent. 6) Tax payers can claim deduction of up to Rs. 1.50 lakh under Section 80C. Instruments that qualify under Section 80 C include public provident fund, employees provident fund, tax-saving mutual funds, 5-year fixed deposits. 7) In case of self-occupied house, a deduction of up to Rs. 2 lakh on account of interest on house property loan can be claimed. 8) An additional deduction of Rs. 50,000 is allowed for contribution made towards National Pension System under Section 80CCD. This is over and above Rs. 1.5 lakh deduction available under Section 80C. 9) A deduction of Rs. 25,000 is allowed for health insurance premium. 10) An exemption of Rs. 19,200 per year (Rs. 1,600 per month) can be claimed against transport allowance. 1) Deduction limit under Section 87A of the Income Tax Act has been raised from Rs. 2,000 to Rs. 5,000 per annum. This will help over 2 crore taxpayers save more. 2) Taxpayers who live in rented houses and don’t get house rent allowance (HRA) can deduct Rs. 60,000 per annum from their income from the current Rs. 24,000. 3) An additional deduction of Rs. 50,000 on interest paid by first-time home buyers on home loans of up to Rs. 35 lakh, provided the house value doesn’t exceed Rs. 50 lakh, has been announced. 4) Super-rich, or those with an income of over Rs. 1 crore, will have to pay more taxes as surcharge has been raised from 12 per cent to 15 per cent. 5) Individuals who receive dividends in excess of Rs. 10 lakh per annum will now have to pay 10 per cent tax on gross amount of dividend. 6) Cars priced Rs. 10 lakh and above will attract 1 per cent tax. Purchase of goods and services in cash exceeding Rs. 2 lakh will also attract 1 per cent tax. An infrastructure cess of 1 per cent on small petrol, LPG and CNG cars, 2.5 per cent on diesel cars of certain capacity, and 4 per cent on SUVs will make buying all cars costlier. 7) Eating out in restaurants, buying property and insurance, and making mobile phone calls will become more expensive from June 1, 2016 because of a “Krishi Kalyan” cess of 0.5 per cent, which will be levied on all services. 8) Cigarette prices will go from next financial year as excise duty on tobacco products (other than beedi) has been hiked from 10 per cent to 15 per cent. 9) Single-premium insurance premiums will get cheaper as service tax on policy premiums has been cut from 3.5 per cent to 1.4 per cent. 10) Branded retail garments will become costlier as Budget 2016 has proposed a 6 per cent excise on branded retail garments priced more than Rs. 1,000. 10) Imitation jewellery is also set to cost more as basic customs duty has been increased from 10 per cent to 15 per cent. Kunal Bahl, CEO of Snapdeal said it is imperative that regulation, policy and business evolve in sync and recalibrate often so that the rules of engagement are mutually clear, contemporary and relevant. “The responsibility of this lies both with the government and the industry,” said Bahl. Snapdeal plans to regularly come up with such communiques with PwC focusing on policy matters relevant for digital businesses. Relaxation of the Section 79 of the Income Tax Act has been one of the top demands of the industry since they are unable to carry forward and set off the business losses that they typically incur in the initial years of their operations, because of the dilution of the original promoter shareholding beyond 49%, to other investors/VCs/PE players. The paper makes the case that with dynamic infusion of funds in modern start-ups, the shareholding patterns change often.